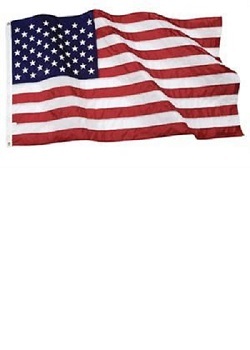 The MADE IN USA, 3' x 5' USA Flag is made from a poly-cotton blend material. The Poly-cotton flag is one solid piece of fabric with the flag image printed with brass grommets. Great for use outdoors or indoor. From Paul Lynch of Virginia Beach, Virginia on 10/4/2017 . Not recommended. Cheap material that will not stand up. The exact same item is available online or in local stores for significantly less. Response From Patriot Guard Riders: We do not currently offer any "highway" rated flags. We recommend you consulting with fellow riders at your missions to see what flags they have had success flying.